I feel pretty guilty that I’ve let the blog content slide in 2011. As you can imagine, between having a near-toddler cruising around the house, doing a major redesign of a QRP transceiver, and trying to bootstrap a new small business, free time is at a premium (and my wife and kid owns what little there is). The least that I can do is give you a quick glimpse into the progress with the radio. If you don’t follow me on Twitter, you probably don’t know any of the details of my progress with the CC-Series radio. After advancing the design of the radio to a point where I thought it was production-ready (two PCB turns, lots of design review and tweaking), I ended up failing pretty miserably in the end. The problem was with a subtle, but noticeable pull on the free-running VFO on transmit (which was not present on the prototype). I spent close to 2 months attempting to troubleshoot that one little problem, but sadly it ended up defeating me. Perhaps “defeat” isn’t the correct word. There was a part of me that wanted to keep stubbornly trying until I tackled the problem (ask poor Jennifer about my stubbornness). But I had to look at the issue realistically, from a business point-of-view. I had no idea if it would take me a few more days or many more months to solve my problem. So in the interest of trying to save my fledgling company, which hasn’t even made it out of the nest, I made the difficult decision to temporarily abandon the CC-Series development. Instead, I decided that I would take on a similar project: revamping my minimalist entry in the 2010 FDIM Challenge (the 72 part rig). It started as just a few upgrades, but quickly spun into a new project of its own. When the VXO scheme that I wanted to try didn’t work out as I had hoped, I decided that I would bite the bullet and add a DDS to the project. I planned on reworking the CC-Series with a DDS anyway, so this would be a good way to learn how one works. In order to make the rig worthy to be sold to other people, I kept incorporating changes and features from the CC-Series. I also leveraged my firmware from the CC-Series, which made it easy to get up to speed with the new radio fairly quickly. By now, the rig resembles what I intended the CC-Series to be in the first place. A few nights ago, I made my first QSO with the rig with W7GVE in AZ. We had a nice little chat and he let me know that I had a little bit of chirp on my signal. Right after I signed off with Ed, I got a really pleasant surprise. Who else but the great father of us QRP homebrewers, W7ZOI! He dropped in to give me a quick “hi” when he heard me on the QRP watering hole of 14.060 MHz. According to my (admittedly incomplete) log on my PC, this was my first QSO with Wes. It was a great thrill, but unfortunately I missed about 25% of his transmissions because I was too nervous to copy CW well. I fully admit that my CW is still lousy, and my comprehension drops off the cliff when the other guy is going greater than about 15 WPM and I’m jittery. I made some tweaks to the transmitter (and torched some finals in a spectacular, fireworks fashion), then managed to make a sked with one of my partners in crime, AA7EE. It was a rough QSO, especially for me, but we exchanged signal reports so it counted (20 meters at 2200 local on a short path between us is not conducive to communication). Better yet, Dave reported that the signal was rock-solid and chirp-free. So where do we stand now? 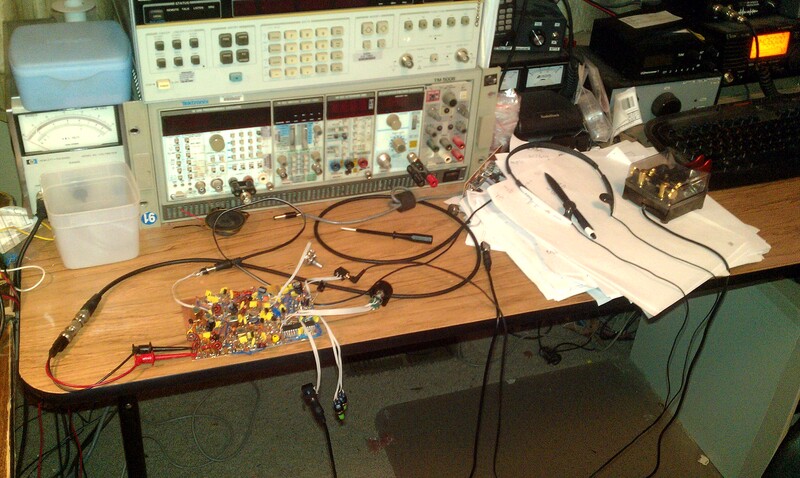 I want to do a little more on-the-air testing, then I’m going to start laying out the PCB. The last time I ordered prototype PCBs from my vendor, they were very high-quality, but the turn around time was less than desirable (nearly 3 weeks). This time, I’m going to see if I can lay out the board with minimum vias (probably not going to happen). If I can do that, I might be able to make my own board with the toner transfer method. If not, then I’m going to look into a vendor that can give me boards with more alacrity, at least for the prototypes. It’s been frustrating, but it’s also forced me to refine all of the circuits in my radio in order to make them as bulletproof as possible. As long as I can get this puppy to market, then it will have been worth the heartache. Last night, I had another QSO with AA7EE so that he could record my transmissions and send me back the recording for evaluation. We had talked about meeting sometime after dinner, but set no specific time. Right around 1900 local, I fired up the rig on 14.060 MHz and was just getting ready to send a tweet to Dave to see if he was around. Within about 30 seconds of turning on the rig, I heard someone calling CQ on the watering hole frequency. Sure enough, it was AA7EE. I established contact and we had a quick little chat. Thanks to Dave’s generosity, I’ve posted his recording of the QSO below. The QSB was bad on my end, but as you can hear from the recording it wasn’t very bad on his end. Even though the signal was weak, the note from the rig sounds clean, stable, and chirp-free. Be sure to stick around to the end of the recording for a few moments of commentary from Dave himself. So funny that when we QSO on 40, you copy me better than I copy you, and then it’s the other way around on 20. This evening’s QSO on 14060 was very exciting for me, because although I was only copying you at a signal strength 3, it was a clear channel and you were perfectly Q5 – the exciting part though was that ur sigs were rock solid – no drifting or chirp, and while listening to them, I was thinking that I would be proud to be sending signals like that from my station. I know you still have quite a bit of work ahead of you with the design of the PCB, but the new CC-series (or whatever it is finally called) feels closer than it has ever been. I’m really looking forward to this beta kit!